Olivia Villa-Real is a singer, pianist, composer and writer who combines her artistry in music with her passion for writing. Hailing from the Orient, the Philippines, she infuses her music with the sensitivity and sentimentality that permeate the Asian culture. However, growing into the fullness of womanhood in Los Angeles, the melting pot of different cultures, her music has been transformed into an amalgamation of Asian, European, Latin and American sentiment and rhythm. She believes that our current-day music, though rich in rhythm and vivacity, needs a depth of feeling that appeals to the human soul. Music is the perfect vehicle to communicate our value system to the masses. The lyrics, if delicately embedded in the music that supports them, go straight to the heart and poignantly move the human spirit. What better means can the human mind communicate with others in its efforts to touch their hearts and move their spirits, than in a language so powerful and universal as music? She started her piano studies at the tender age of five and was winning competitions and playing with orchestras at age twelve. While singing in a church service, she was spotted by someone who was instrumental to her winning a scholarship in vocal performance. Her vocal studies led her to the discovery of a new realm of music-–the opera, oratorio, lieder and art songs. Imbibing these classical influences, along with the everyday language of pop music, she developed her own style of singing and composing along the lines of pop music with classical overtones, in an effort to bring to the common mass the richness and beauty of classical music. 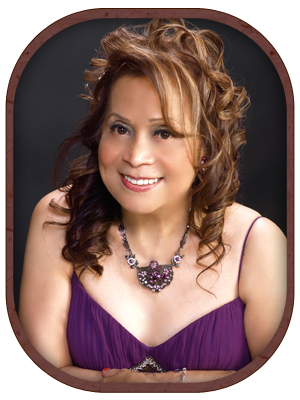 An accomplished singer, she sings in a wide variety of languages– German, French Spanish, Portuguese, Latin, English and in three Filipino dialects. She has performed in many concert halls in the United States and abroad, including two major solo concerts at the Dorothy Chandler Pavilion of the Los Angeles Music Center. A holder of a Bachelor and a Master’s degree in English and in Music, she has 68 musical compositions (words & music), a novel (The Velvet Thorn), a collection of poetic prose and poetry, (Murm’rings of the Heart), a treatise (A Critical Study of Ernest Hemingway’s Philosophy of Meaningful Existence) and a line of greeting cards. She teaches Piano and Voice in Eagle Rock, Los Angeles and belongs to the Music Teachers Association of California and the National Guild of Piano Teachers. She is also a member of the American Society of Composers, Authors and Publishers, American Guild of Variety Artists, Screen Actors Guild, American Federation of Television and Radio Artists and American Federation of Musicians.